With the 2015 women’s soccer World Cup being hosted by Canada, and the games just getting underway, we figured it was a good time to spotlight our spectacular and diverse neighbor to the north by calling out a couple of our favorite cities and their surrounds. 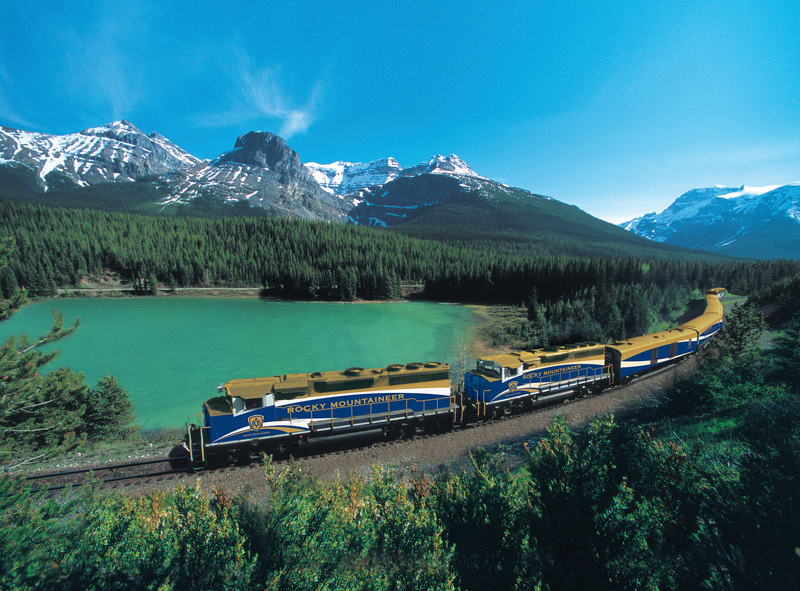 Whether you’re preparing for a luxurious Canadian Rockies rail journey or unwinding after an exhilarating Alaska cruise, coastal Vancouver and active adventure-filled Alberta offer the ideal anchor where you can indulge in your favorite adventures and discover new pursuits along the way. complex. A glass elevator whisks you more than 500 feet up, affording a 360-degree perspective of the cityscape embraced by the Pacific Ocean and North Shore Mountains. Tucked at the foot of the majestic range lies the Capilano Suspension Bridge, towering 230 feet above the Capilano River. For another mid-air feat in the same park, cross the cantilevered Cliffwalk, jutting from granite escarpments. Portions of the walkway are supported by sturdy glass, providing a thrilling view of the canyon below. Delve deeper into the wilderness at Grouse Mountain, where the Skyride lofts you over fir-populated peaks for an aerial view of Vancouver en route to the mountaintop Observatory restaurant. Relax over a five-course tasting menu paired with wines as the sun sets and the city’s lights begin to shimmer. Devote more time to the charms of British Columbia as you wind your way north along the scenic Sea to Sky Corridor to the neighboring town of Squamish, where you can satisfy your adventurous side on the Sea to Sky Gondola. Enclosed cabins soar 2,903 feet high, revealing sweeping views of the Howe Sound fjord enveloped by coastal forests and mountain peaks. At the top, stand above the treetops on the Pilot Suspension Bridge, a dramatic walkway suspended in the air, overlooking alpine ridges and the fjord thousands of feet below. With waterways surrounding the city, sightseeing by sea is a perfect way to experience Vancouver’s gems. Tour Vancouver Harbour on a Zodiac-style cruise to catch highlights like Stanley Park, occupying over 1,000 acres on the border of downtown, and the eco-friendly Vancouver Convention Centre poised on the waterfront. Dock at Granville Island for lunch at the public market, offering everything from fish and chips and authentic Indian curry to warm donuts with raspberry jam. Another network through the heart of the city is False Creek, an ideal thoroughfare to explore by kayak. With an expert guide, float past the seaside homes and bay-inlet beaches clustered along the banks. Or devote a day to paddling out to Vancouver’s outlying lakes and sounds for a scenic tour of the lower mainland’s natural wonders. Ask any water-obsessed local their preferred method of transport and they’ll point you to BC Ferries — climb on board for service across the Georgia Strait in just 95 minutes. You’ll arrive on Vancouver Island, where the capital city of Victoria punctuates the southern tip, making it a sublime spot for salmon fishing or a swim at Willow’s Beach. With its charming tree-lined streets and seawalls, Vancouver is well-suited for discovery on foot. ToursByLocals offers customized walking tours led by Vancouverites who reveal the city’s secret spots. Whether you want to taste traditional Italian coffee along Commercial Drive or peruse artists’ studios on Granville Island, your expert guide will lead you on a full- or half-day odyssey. See Vancouver’s sophisticated side on a stroll through the Dr. Sun Yat-Sen Chinese Garden, a sanctuary of ponds and foliage hidden in the hub of the city. Nearby, a classic interpretation of the arts is found at the Vancouver Art Gallery, displaying contemporary works as well as exhibitions of beloved masters. Explore beyond the city limits and enjoy the unparalleled natural beauty of the area. Relax on a chartered road trip along the scenic Sea to Sky Highway, hugging the glittering shores of Howe Sound and winding up the peaks of Whistler; or get there in style with Scenic Rush and satisfy your hunger to drive a luxurious exotic car. Charting the same course — and equally breathtaking — is Rocky Mountaineer’s Sea to Sky Climb rail journey. Indulge in astonishing views of ever-changing landscapes transforming from ocean vistas to the 230-foot tumbling Brandywine falls, past an extinct volcano before arriving at the doorstep of Whistler Village. Canada’s quintessential Wild West, the province of Alberta serves as a sprawling natural playground for year-round excitement. Sharing its southern border with Montana, and nestled between the snowcapped Canadian Rockies and the dinosaur-trodden Canadian Badlands, Alberta inspires pursuits as dynamic as its landscape. Snowshoe, ski and drive a dogsled through winter’s pristine powder. Then, as snow gives way to warmer temperatures, set off on equestrian adventures across flower-dappled prairies and hike or bike along craggy mountain slopes. Five national parks scrupulously preserve the great outdoors while the bustling cities of Edmonton and Calgary widen the scope for urban leisure. We’ve hand-selected a few “park” attractions to showcase Alberta’s impressive range and give you a few ideas for endless fun. springs found in the Cave & Basin National Historic Site, pooling at the foot of Sulphur Mountain. Enter the cave and onsite museum to see the original thermal pool that created a flood of interest among Aboriginals and settlers, and later inspired the government to start protecting its natural treasures. Today, you can luxuriate year-round in the healing waters of Banff Upper Hot Springs while staring out at scenery pulled straight from movie backdrops such as Brokeback Mountain. Or, peruse the eclectic shops, galleries and restaurants lining Banff Avenue in the town center before retreating to nearby acclaimed hotel The Fairmont Banff Springs, styled after a Scottish baronial castle. 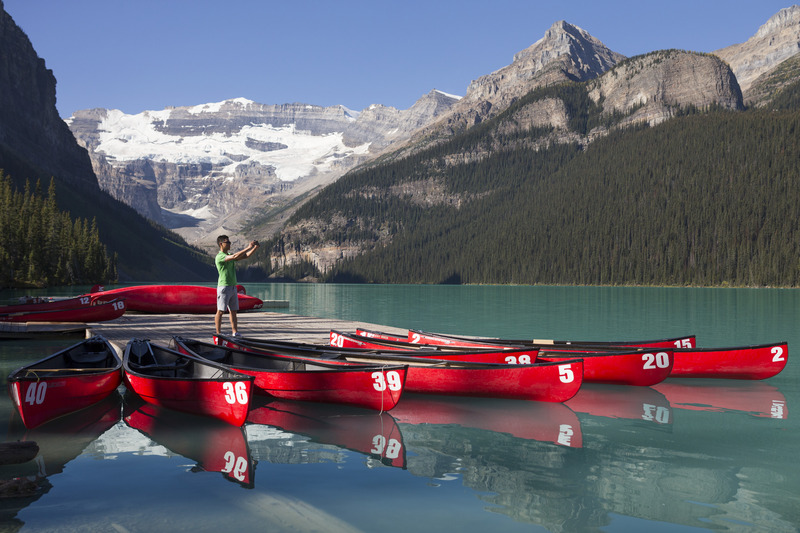 Paddle across the glistening waters of the park’s famous Lake Louise in a kayak, set out on a hike within a network of trails extending over 1,000 miles or be dropped into the mountain peaks from a helicopter to lay new tracks as you ski untouched terrain. 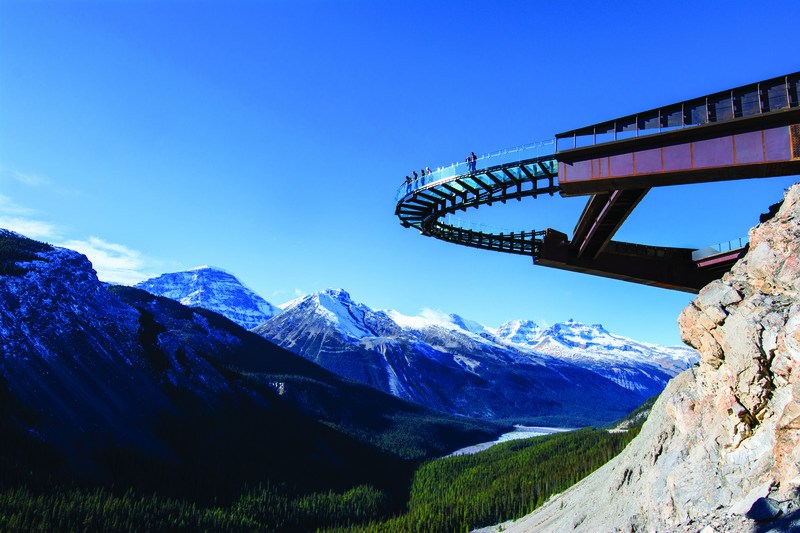 glass platform and engineering phenomenon, suspended 918 feet above ice-carved Sunwapta Valley, and learn geological details about the surrounds from the six interpretative stations. For a more intimate encounter with the waterfalls and wildlife below, explore the park’s 4,200 square miles of alpine terrain from the saddle. Horse trails take you back through 150 years of equestrian influence on fur traders and early traders to today’s famous “Mounties,” the Royal Canadian Mounted Police. inflatable ball — the first of its kind in Canada. Amusing escapades can also be found in Calgary, a place to enjoy natural beauty and the fascinating history of the Wild West by day and world class cuisine and entertainment by night. At WinSport’s Canada Olympic Park, the epicenter of the 1988 Winter Olympic Games, you can test your skills on the new Skyline Luge or launch yourself off a ski jump tower and experience the continent’s fastest zip line. Another popular attraction is Calgary’s Heritage Park Historical Village, which celebrated its 50-year golden anniversary in 2014. Interact with pioneers, ride an authentic steam train and peruse vintage vehicles to glean a better understanding of how Canada’s west was won. This entry was posted on June 9, 2015 by townandcountrytravel in Uncategorized.